The Villas at Seven Dwarfs Lane is the #1 and newest premier resort and vacation rentals in the Orlando area, near Disney World. Its proximity to Orlando's world-renowned attractions is unrivaled. Staying in one of Townhome gives you automatic membership to all the private resort facilities, for the duration of your stay. Disney World is only 4 miles away, and the many shops and restaurants of HWY192 are at walking distance. There is a luxury clubhouse and recreation center including an elegant lounge room, game room, fitness center, reading area, business center with high speed internet connection and library. Our resort is gated and guarded 24 hours. Outside, the activities just keep getting better; the center piece is the huge heated swimming pool with wrap-around sundeck and dynamic water features, and there is a fishing pond, sand volleyball, tennis and basketball courts. There is a special play area for our younger visitors and an area where you can even have your own family BBQ at our picnic area. First time renting a resort over all it was a good experience. Overall, the place was sufficient. I traveled with a family of 8. The place had a great lay out and lots of room. The place was dated and had cosmetic imperfections. The property was clean. It was nothing glamourous but decent. I booked the place for myself, sister, brother and children. They believed the place should get five stars but I did not agree just because of little things. When I got to the front gate, I didn't get the last email but the security officer called in and got the code he needed. I didn't get my last email until the day of my arrival. When I called about a spot on the covers and the wifi code, no one called back just texted me the code. We visited Universal which was about 25min away. When we arrived Monday, the main street was congested but the others days, not as much. Pros: Restaurants, shopping center, Walmart, liquor store, Target, and Sam's club very near, some walking distances. Apple Bees, Waffle house, and Wendy's was walking distances. The Walmart sold Florida souvenirs and there was also a cheap store on the main highway for souvenirs. They had amenities such as pool, bar, club house and internet but we did not have time to enjoy them. There was an ice machine in the refrigerator. I felt safe. The area was quiet and nestled in a good area. Cons: The washer/dryer was small for a large family. There weren't enough towels. Due to rules, we were not able to invite people over to just hang out. There was a quiet time in the complex. They did not provide any paper towels or extra toilet paper. The process of getting a room was a lot of paperwork. I would stay at this property again. This is my 4th time staying with “Near to Disney” so it is never so bad that I won’t come back, however this time was probably my least enjoyable experience. The closet with the water heater and A/C was continually leaking as soon as we got there, which caused the main hallway carpet to be drenched with water. I called immediately for maintenance and after a day at the parks, no one had came out to fix the issue. 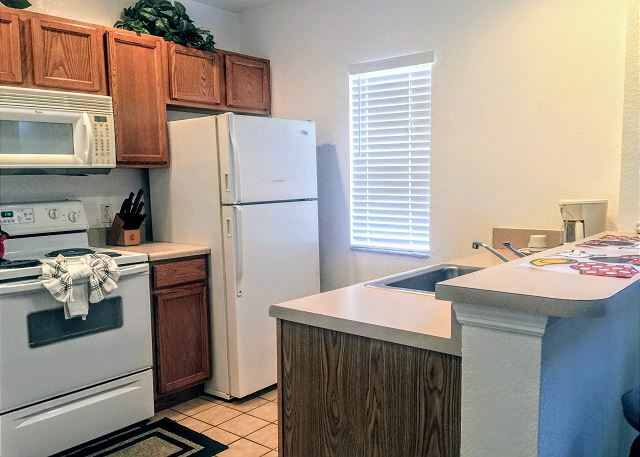 The overall function of the townhome is amazing. It has four rooms with beds that you can sleep in. When we come to Orlando we don’t spend much time in the hotel/condo so we aren’t looking for luxuries. The splash pad is also amazing for the young ones and this place is one of the few that is cheap, but also has a lot of amenities. If you are looking for a nice, hotel style feel, this isn’t for you. If you want a place that is comfortable, cheap, and gets the job done, try this place out. The only other thing that should be mentioned is that the paperwork process is a little redundant. It should be an all online process, not 1/2 online and then 1/2 (very similar paperwork) at the security gate where you are holding up the line. Location and park amenities were awesome. Loved our time at 2612 4-101. We all enjoyed our stay. I do have a few items of concern. #1 mattress downstairs...way too soft! #2 coffee maker needing to be replaced. #3 no large dinner pot or roaster - we don't eat out often and enjoy cooking at home. #4 carpet and cushion burns didn't look good. Chair covers need cleaning. 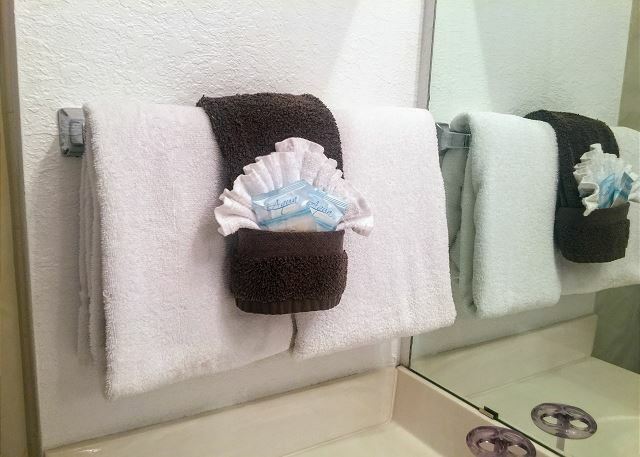 #5 shortage of hand towels and kitchen towels. Other than that, all was well. Clean and pride of ownership. Good TV and Internet. Loved the pool and all the amenities of the property. Grandchildren visited Disney and Aquatica. We ate out and shopped and walked. This was our second time at Villa of Seven Dwarfs - first time in your property -and we would certainly rent your property again. We paid quite a bit of money for 10 days and we wish those items had been addressed prior to our rental. Had it been cheap, we would not have a complaint. There were many wonderful aspects of my stay: extremely clean townhouse, friendly and efficient front gate guard, great town home layout which gave privacy to bedroom occupants, and close enough to Epcot (20 minutes). The most outstanding element was the unbelievable quick response by the manager. At 10 p.m. on the night of our arrival, we realized that there was no notation in the unit regarding the Internet connection. When I had booked this place, the manager assured me that phone calls to him regarding the unit would be returned within 10 minutes. Although I had no reason to doubt him, I could have considered it an empty promise. Well, he really did call back within less than 10 minutes. We were more than impressed. We shall return another time. Note: Although not a negative, be aware that there is a minimal starter kit (1 small round soap and 1 roll of toilet paper in each bathroom plus 1 packet of dishwasher soap in kitchen). Make sure to take other items that you might like to use, especially if you plan to stay more than 1 night. An onsite shop sells various toiletries and kitchen items. The club house was decorated for Halloween. The community also offers a beautiful pool area and activities (e.g. karaoke night and bar).